ACE Tips: How To Mount And Adjust Your Gas Spring – ACE Controls Inc. 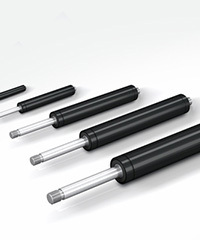 Mounting a standard gas spring is easier than you think. In this blog post, we’re providing you with some helpful tips on how to best mount your spring—ensuring it operates safely and reliably while fulfilling the pressure requirements of your application. We’ll also explore how you can quickly adjust the pressure using our user-friendly, built-in valve technology. Gas springs contain a small amount of oil in the pressure tube. This oil is important for two reasons: first, it lubricates the main seal and rod. It also creates damping at the end of each stroke—particularly the last few millimeters. Remember: it’s very important to mount your spring with the piston rod facing downwards. This position keeps the oil in contact with the rod seal, preventing it from drying out. But more importantly, it ensures the piston dives into the oil, which reduces the velocity at the end of extension. You may find, at some point, that your spring has too much pressure. This could be the result of many things. The technical data related to sizing may have been incorrect or unknown at the time of specification. The design of your machine may have also changed. Whatever the case may be, our valve technology lets you easily adjust and fine-tune the gas pressure and extension force of your spring. Each spring integrates a pressure valve in the stud of the end fitting. Simply thread our DE-GAS adjustment knob onto the stud and press down to release small amounts of nitrogen gas. Now your spring is adjusted. 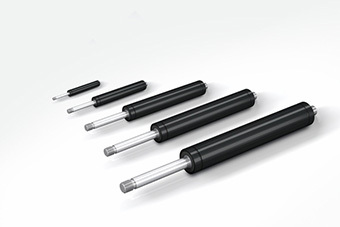 Here at ACE Controls, we offer a full range of motion control products, including industrial push- and pull-type gas springs, hydraulic dampers and door dampers. For free sizing or on-site support, contact our local support team. Our application engineers are always ready to provide you with the help you need to make sure your spring is tailor-made your application.